Walsall beat promotion-chasing Southampton and moved out of the League One relegation zone. The home side had goalkeeper Jimmy Walker to thank for keeping the scores level, as he denied Lee Barnard, Morgan Schneiderlin and Adam Lallana. Jon Macken burst onto an Aaron Lescott long ball and chipped keeper Kelvin Davis to put the Saddlers in front. Southampton were unable to find an equaliser and fell to their first defeat in six games. "We absolutely battered them. They got one opportunity, it came of Rahdi's (Jaidi) head and the lad's gone through and he took it well. "We looked powerful, strong and we created so many opportunities and the ball wouldn't go in the back of the net. "We looked a massive threat from set-plays. We had so many opportunities it was untrue." 90:00+5:26 The referee ends the match. 90:00+4:45 Goal kick taken long by Jimmy Walker (Walsall). 90:00+3:55 Goal kick taken long by Aaron Lescott (Walsall). 90:00+3:45 Shot by Radhi Jaidi (Southampton) volleyed left-footed from left side of penalty area (20 yards), missed right. 90:00+3:05 Goal kick taken long by Jimmy Walker (Walsall). Correction - 90:00+1:32 Substitution Jonathan Macken leaves the field to be replaced by Emmanuele Smith. 90:00+1:32 Substitution Walsall substitution: Jonathan Macken replaced by Emmanuele Smith (tactical). 90:00+1:24 Goal kick taken long by Jimmy Walker (Walsall). 90:00+1:24 Booking Adam Lallana (Southampton) booked for dissent. 90:00+0:39 Goal kick taken long by Kelvin Davis (Southampton). 90:00 Foul by Dean Hammond (Southampton) on Darren Byfield (Walsall). Free kick taken left-footed by Matthew Richards (Walsall) from right channel, resulting in open play. 89:49 Goal kick taken long by Jimmy Walker (Walsall). 89:19 Shot by Richard Lambert (Southampton) volleyed right-footed from left channel (25 yards), over the bar. 87:56 Shot by Richard Lambert (Southampton) right-footed from centre of penalty area (18 yards), blocked by Tom Williams (Walsall). Outswinging corner from right by-line taken right-footed by Richard Chaplow (Southampton) to centre, clearance by Andy Butler (Walsall). 87:24 Defending throw-in by Danny Butterfield (Southampton). 86:53 Defending throw-in by Aaron Lescott (Walsall). 86:26 Defending throw-in by Aaron Lescott (Walsall). 86:08 Defending throw-in by Aaron Lescott (Walsall). 85:41 Weak shot by Dan Harding (Southampton) volleyed left-footed from left channel (30 yards), save (caught) by Jimmy Walker (Walsall). 84:45 Goal kick taken long by Jimmy Walker (Walsall). 83:46 Jonathan Macken (Walsall) caught offside. Free kick taken right-footed by Kelvin Davis (Southampton) from own half, resulting in open play. 82:56 Attacking throw-in by Dan Harding (Southampton). 81:55 Inswinging corner from right by-line taken left-footed by Matthew Richards (Walsall) to short, cross by Richard Taundry (Walsall), clearance by Richard Lambert (Southampton). 81:20 Inswinging corner from left by-line taken right-footed by Richard Taundry (Walsall) to near post, clearance by Jose Fonte (Southampton). 81:12 Attacking throw-in by Tom Williams (Walsall). 80:44 Attacking throw-in by Tom Williams (Walsall). 80:06 Attacking throw-in by Aaron Lescott (Walsall). 79:41 Header by Lee Barnard (Southampton) from left side of six-yard box (6 yards), clearance by Andy Butler (Walsall). 78:54 Foul by Darren Byfield (Walsall) on Jose Fonte (Southampton). Free kick taken right-footed by Kelvin Davis (Southampton) from own half, resulting in open play. 78:17 Attacking throw-in by Aaron Lescott (Walsall). 77:12 Foul by Emanuel Jorge Ledesma (Walsall) on Jose Fonte (Southampton). Free kick taken right-footed by Danny Butterfield (Southampton) from own half, resulting in open play. 77:12 Substitution Walsall substitution: Emanuel Jorge Ledesma replaced by Darren Byfield (tactical). 76:40 Goal kick taken long by Jimmy Walker (Walsall). 76:29 Shot by Adam Lallana (Southampton) right-footed from left side of penalty area (25 yards), missed left. 75:12 Defending throw-in by Tom Williams (Walsall). 72:53 Foul by Jonathan Macken (Walsall) on Danny Butterfield (Southampton). Free kick taken right-footed by Danny Butterfield (Southampton) from own half, resulting in open play. 72:09 Foul by Lee Barnard (Southampton) on Andy Butler (Walsall). Free kick taken right-footed by Oliver Lancashire (Walsall) from own half, resulting in open play. 71:09 Foul by Richard Lambert (Southampton) on Aaron Lescott (Walsall). Free kick taken right-footed by Jimmy Walker (Walsall) from own half, resulting in open play. 71:03 Defending throw-in by Dan Harding (Southampton). 70:58 Goal kick taken long by Kelvin Davis (Southampton). 70:19 Substitution Southampton substitution: Dany N'Guessan replaced by Alex Oxlade-Chamberlain (tactical). 70:09 Weak shot by Emanuel Jorge Ledesma (Walsall) volleyed right-footed from right channel (25 yards), missed left. 69:47 Foul by Radhi Jaidi (Southampton) on Emanuel Jorge Ledesma (Walsall). Free kick taken left-footed by Matthew Richards (Walsall) from right wing, resulting in open play. 69:45 Defending throw-in by Aaron Lescott (Walsall). Correction - 68:21 Aaron Lescott provided the assist for the goal. Correction - 68:21 GOAL - Jonathan Macken:Walsall 1 - 0 Southampton Jonathan Macken scores a goal from long range to the bottom right corner of the goal. Walsall 1-0 Southampton. 68:21 Assist by Aaron Lescott (Walsall) from left channel. 68:21 GOAL - Jonathan Macken:Walsall 1 - 0 Southampton Goal by Jonathan Macken (Walsall) right-footed (bottom-right of goal) from right channel (30 yards).Walsall 1-0 Southampton. 68:05 Foul by Richard Lambert (Southampton) on Emanuel Jorge Ledesma (Walsall). Free kick taken right-footed by Jimmy Walker (Walsall) from own half, resulting in open play. 67:37 Substitution Walsall substitution: Paul Marshall replaced by Alex Nicholls (tactical). 67:04 Outswinging corner from right by-line taken right-footed by Adam Lallana (Southampton) to centre, header by Jose Fonte (Southampton) from left side of six-yard box (12 yards), save by Jimmy Walker (Walsall). 66:43 Corner from left by-line taken short left-footed by Adam Lallana (Southampton). Clearance by Andy Butler (Walsall). 66:13 Inswinging corner from left by-line taken right-footed by Adam Lallana (Southampton) to centre, header by Richard Lambert (Southampton) from centre of penalty area (12 yards), save (punched) by Jimmy Walker (Walsall). 65:13 Goal kick taken long by Kelvin Davis (Southampton). 64:42 Attacking throw-in by Richard Taundry (Walsall). 63:48 Foul by Dan Harding (Southampton) on Emanuel Jorge Ledesma (Walsall). Free kick taken left-footed by Tom Williams (Walsall) from own half, resulting in open play. 63:27 Outswinging corner from right by-line taken right-footed by Adam Lallana (Southampton) to far post, clearance by Paul Marshall (Walsall). 62:39 Foul by Andy Butler (Walsall) on Lee Barnard (Southampton). Free kick taken right-footed by Danny Butterfield (Southampton) from right channel, resulting in open play. 62:04 Goal kick taken long by Jimmy Walker (Walsall). 61:16 Goal kick taken long by Jimmy Walker (Walsall). 60:39 Outswinging corner from right by-line taken right-footed by Adam Lallana (Southampton) to far post, header by Radhi Jaidi (Southampton) from left side of penalty area (20 yards), missed right. 59:50 Goal kick taken long by Jimmy Walker (Walsall). 59:38 Shot by Richard Chaplow (Southampton) volleyed left-footed from left channel (18 yards), missed left. 58:40 Defending throw-in by Aaron Lescott (Walsall). 57:17 Goal kick taken long by Jimmy Walker (Walsall). 56:54 Defending throw-in by Aaron Lescott (Walsall). 56:38 Defending throw-in by Aaron Lescott (Walsall). 56:23 Goal kick taken long by Kelvin Davis (Southampton). 56:10 Shot by Julian Gray (Walsall) left-footed from right channel (30 yards), missed left. 54:39 Inswinging corner from left by-line taken right-footed by Richard Taundry (Walsall) to near post, clearance by Richard Chaplow (Southampton). 54:16 Inswinging corner from right by-line taken left-footed by Matthew Richards (Walsall) to far post, clearance by Radhi Jaidi (Southampton). 54:04 Shot by Aaron Lescott (Walsall) right-footed from centre of penalty area (25 yards), blocked by Jose Fonte (Southampton). 52:33 Outswinging corner from right by-line taken right-footed by Adam Lallana (Southampton) to near post, clearance by Tom Williams (Walsall). 52:13 Cross by Richard Chaplow (Southampton), clearance by Aaron Lescott (Walsall). 51:48 Outswinging corner from right by-line taken right-footed by Adam Lallana (Southampton) to short, resulting in open play. 51:23 Foul by Tom Williams (Walsall) on Dany N'Guessan (Southampton). Free kick taken right-footed by Danny Butterfield (Southampton) from right wing, resulting in open play. 50:08 Foul by Dan Harding (Southampton) on Paul Marshall (Walsall). Free kick taken right-footed by Jimmy Walker (Walsall) from own half, resulting in open play. 48:50 Foul by Dany N'Guessan (Southampton) on Julian Gray (Walsall). Free kick taken left-footed by Tom Williams (Walsall) from own half, resulting in open play. 48:13 Defending throw-in by Aaron Lescott (Walsall). 47:51 Shot by Dan Harding (Southampton) right-footed from left channel (25 yards), comfortable save (caught) by Jimmy Walker (Walsall). 47:18 Defending throw-in by Aaron Lescott (Walsall). 46:29 Inswinging corner from left by-line taken right-footed by Adam Lallana (Southampton) to near post, clearance by Aaron Lescott (Walsall). 46:06 Attacking throw-in by Adam Lallana (Southampton). 45:47 Defending throw-in by Dan Harding (Southampton). 45:17 Attacking throw-in by Aaron Lescott (Walsall). 45:00+3:36 The referee calls an end to the first half. 45:00+3:26 Defending throw-in by Danny Butterfield (Southampton). 45:00+3:09 Attacking throw-in by Tom Williams (Walsall). 45:00+2:38 Handball by Richard Chaplow (Southampton). Free kick taken right-footed by Jimmy Walker (Walsall) from own half, resulting in open play. 45:00+2:38 Booking Richard Chaplow (Southampton) booked for dissent. 45:00+1:48 Foul by Richard Lambert (Southampton) on Andy Butler (Walsall). Free kick taken right-footed by Matthew Richards (Walsall) from left channel, passed. 45:00+1:21 Handball by Dean Hammond (Southampton). Free kick taken left-footed by Tom Williams (Walsall) from own half, resulting in open play. 45:00+0:59 Defending throw-in by Danny Butterfield (Southampton). 45:00+0:19 Foul by Dany N'Guessan (Southampton) on Tom Williams (Walsall). Free kick taken right-footed by Jimmy Walker (Walsall) from own half, resulting in open play. 44:48 Emanuel Jorge Ledesma (Walsall) caught offside. Free kick taken right-footed by Kelvin Davis (Southampton) from own half, resulting in open play. 44:10 Goal kick taken long by Jimmy Walker (Walsall). 44:05 Attacking throw-in by Lee Barnard (Southampton). 41:58 Attacking throw-in by Richard Lambert (Southampton). Defending throw-in by Tom Williams (Walsall). 40:48 Foul by Emanuel Jorge Ledesma (Walsall) on Dean Hammond (Southampton). Free kick taken left-footed by Dan Harding (Southampton) from left wing, resulting in open play. 40:33 Defending throw-in by Aaron Lescott (Walsall). 40:24 Attacking throw-in by Dan Harding (Southampton). 39:20 Goal kick taken long by Kelvin Davis (Southampton). 38:36 Attacking throw-in by Dan Harding (Southampton). 38:33 Goal kick taken long by Kelvin Davis (Southampton). 38:14 Shot by Emanuel Jorge Ledesma (Walsall) right-footed from right channel (35+ yards), over the bar. 37:25 Inswinging corner from left by-line taken right-footed by Adam Lallana (Southampton) to centre, clearance by Aaron Lescott (Walsall). 37:25 Booking Tom Williams (Walsall) booked for unsporting behaviour. 35:59 Inswinging corner from right by-line taken left-footed by Matthew Richards (Walsall) to centre, clearance by Jose Fonte (Southampton). Correction - 34:20 Jose Fonte gives away a free kick for an unfair challenge on Jonathan Macken. Richard Taundry fires a strike on goal direct from the free kick, Kelvin Davis makes a save. 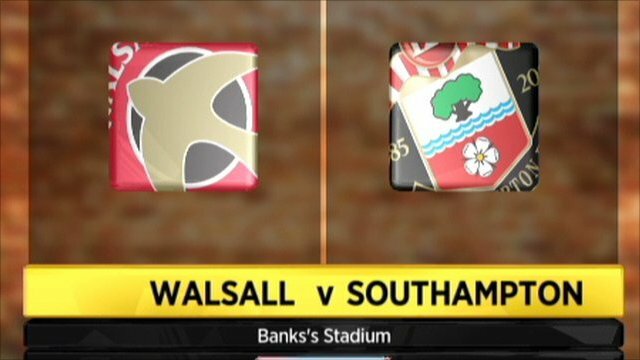 34:20 Foul by Jose Fonte (Southampton) on Jonathan Macken (Walsall). Free kick taken right-footed by Richard Taundry (Walsall) from left channel (25 yards), save (caught) by Kelvin Davis (Southampton). 33:42 Foul by Dean Hammond (Southampton) on Emanuel Jorge Ledesma (Walsall). Free kick taken right-footed by Oliver Lancashire (Walsall) from own half, resulting in open play. 32:24 Emanuel Jorge Ledesma (Walsall) caught offside. Free kick taken right-footed by Dean Hammond (Southampton) from own half, resulting in open play. 32:05 Defending throw-in by Dan Harding (Southampton). 30:57 Foul by Jonathan Macken (Walsall) on Dean Hammond (Southampton). Free kick taken left-footed by Dan Harding (Southampton) from right channel, resulting in open play. 29:44 Defending throw-in by Danny Butterfield (Southampton). 29:23 Defending throw-in by Danny Butterfield (Southampton). 29:06 Foul by Radhi Jaidi (Southampton) on Emanuel Jorge Ledesma (Walsall). Free kick taken left-footed by Matthew Richards (Walsall) from own half, passed. 28:14 Defending throw-in by Dan Harding (Southampton). 27:19 Jonathan Macken (Walsall) caught offside. Free kick taken right-footed by Kelvin Davis (Southampton) from own half, resulting in open play. 26:29 Adam Lallana (Southampton) caught offside. Free kick taken left-footed by Andy Butler (Walsall) from own half, passed. 25:58 Goal kick taken long by Jimmy Walker (Walsall). 25:49 Header by Richard Lambert (Southampton) from left side of penalty area (18 yards), missed left. 25:12 Goal kick taken long by Kelvin Davis (Southampton). 24:53 Defending throw-in by Tom Williams (Walsall). 24:10 Goal kick taken long by Kelvin Davis (Southampton). 23:58 Shot by Emanuel Jorge Ledesma (Walsall) left-footed from left channel (35+ yards), missed left. 23:29 Defending throw-in by Tom Williams (Walsall). 23:00 Goal kick taken long by Jimmy Walker (Walsall). 22:51 Shot by Dean Hammond (Southampton) right-footed from right side of penalty area (18 yards), missed right. 22:08 Shot by Adam Lallana (Southampton) right-footed from left channel (25 yards), save (caught) by Jimmy Walker (Walsall). 21:53 Foul by Jonathan Macken (Walsall) on Adam Lallana (Southampton). Free kick taken left-footed by Dan Harding (Southampton) from left wing, passed. 21:38 Defending throw-in by Aaron Lescott (Walsall). 21:17 Outswinging corner from right by-line taken right-footed by Adam Lallana (Southampton) to centre, clearance by Andy Butler (Walsall). 21:03 Shot by Lee Barnard (Southampton) right-footed from right side of penalty area (20 yards), save by Jimmy Walker (Walsall). 20:33 Attacking throw-in by Danny Butterfield (Southampton). 20:03 Goal kick taken long by Jimmy Walker (Walsall). 19:48 Shot by Jose Fonte (Southampton) volleyed left-footed from centre of penalty area (20 yards), over the bar. 19:19 Foul by Matthew Richards (Walsall) on Dean Hammond (Southampton). Free kick taken left-footed by Dan Harding (Southampton) from left channel, resulting in open play. 18:10 Defending throw-in by Tom Williams (Walsall). 17:28 Handball by Jonathan Macken (Walsall). Free kick taken right-footed by Kelvin Davis (Southampton) from own half, resulting in open play. 16:57 Lee Barnard (Southampton) caught offside. Free kick taken right-footed by Jimmy Walker (Walsall) from own half, resulting in open play. 15:28 Foul by Dean Hammond (Southampton) on Emanuel Jorge Ledesma (Walsall). Free kick crossed left-footed by Matthew Richards (Walsall) from right wing, clearance by Radhi Jaidi (Southampton). 15:15 Attacking throw-in by Aaron Lescott (Walsall). 14:53 Defending throw-in by Dan Harding (Southampton). 14:09 Goal kick taken long by Jimmy Walker (Walsall). 13:42 Outswinging corner from right by-line taken right-footed by Richard Chaplow (Southampton) to near post, shot by Adam Lallana (Southampton) volleyed right-footed from right side of penalty area (25 yards), over the bar. 13:23 Shot by Richard Lambert (Southampton) right-footed from right side of penalty area (20 yards), save (tipped round post) by Jimmy Walker (Walsall). 12:45 Goal kick taken long by Jimmy Walker (Walsall). 12:16 Attacking throw-in by Danny Butterfield (Southampton). 11:57 Defending throw-in by Danny Butterfield (Southampton). 11:00 Attacking throw-in by Aaron Lescott (Walsall). 10:40 Shot by Lee Barnard (Southampton) right-footed from right channel (25 yards), save (caught) by Jimmy Walker (Walsall). 10:10 Foul by Andy Butler (Walsall) on Kelvin Davis (Southampton). Free kick taken right-footed by Kelvin Davis (Southampton) from own half, resulting in open play. 9:28 Inswinging corner from right by-line taken left-footed by Matthew Richards (Walsall) to near post, clearance by Lee Barnard (Southampton). 8:40 Foul by Adam Lallana (Southampton) on Richard Taundry (Walsall). Free kick taken left-footed by Matthew Richards (Walsall) from right wing, passed. 8:21 Foul by Jose Fonte (Southampton) on Jonathan Macken (Walsall). Free kick taken left-footed by Matthew Richards (Walsall) from own half, passed. 7:38 Attacking throw-in by Danny Butterfield (Southampton). 6:49 Defending throw-in by Danny Butterfield (Southampton). Defending throw-in by Tom Williams (Walsall). 6:16 Substitution Southampton substitution: Morgan Schneiderlin replaced by Dany N'Guessan (injury). 4:19 Defending throw-in by Dan Harding (Southampton). 3:46 Foul by Paul Marshall (Walsall) on Lee Barnard (Southampton). Free kick taken right-footed by Kelvin Davis (Southampton) from own half, resulting in open play. 3:01 Attacking throw-in by Lee Barnard (Southampton). 1:34 Shot by Morgan Schneiderlin (Southampton) left-footed from centre of penalty area (20 yards), save (caught) by Jimmy Walker (Walsall). 1:08 Defending throw-in by Dan Harding (Southampton). 0:20 Defending throw-in by Dan Harding (Southampton). 0:10 Defending throw-in by Dan Harding (Southampton).